Katja: Preparation for the creative workshops began long before the actual day. Our host Rodica from NGO ‘Connect’ reminded us over skype to keep in mind participants’ plentiful language skills and diverse age range. Participants who attended our workshops were between 6 and 66 years old (a rough estimation) and brought a rich variety of language resources, including Arabic and of course Romanian and English. A rich presence of languages was guaranteed. It was however unrealistic to expect that we would all be fluent (or even be able to communicate at all) in each others’ languages. One of the main aims I set for the drama workshop was thus to facilitate a communicative space that wasn’t solely dependent on our perfected verbal exchange. I hoped to take into account our human ability to make meaning as an act of sich durchwurschteln (colloquial German for ‘to muddle through’). I wanted to enable encounters in which we could share our languages and life experiences drawing on a range of communication strategies. Here, a drama workshop which prioritises bodily expression can utilise our nonverbal and embodied ways to understand the world around us. Drama creatively lives off our linguistic limitations as it emphasises communication processes beyond words. 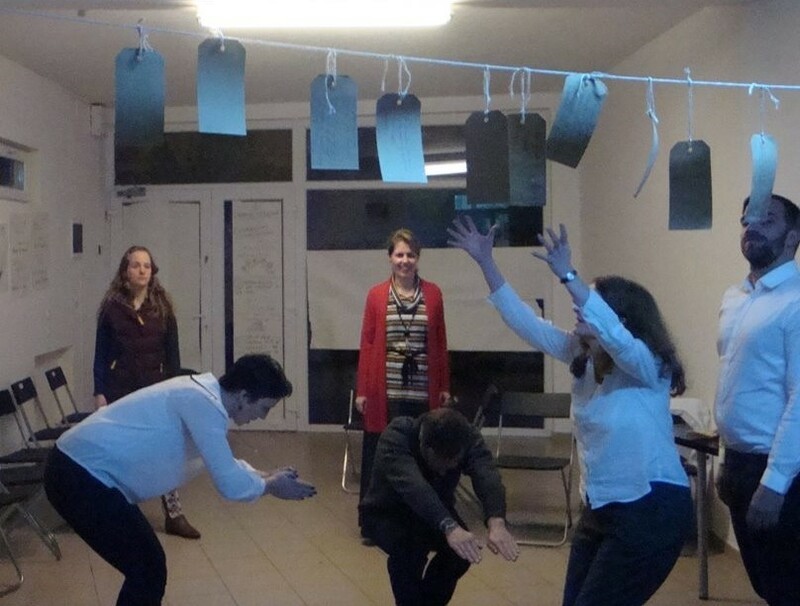 Our linguistic exchanges in the drama workshop were thus embedded in more embodied encounters. The workshop was structured in three sections. Firstly, we learned each others’ names, shared favourite activities and ways of greeting. We then showed each other places that were important in our lives. And finally, we all learned a song in a foreign language together. Elements from all these creative exercises were integrated as part of a short devised performance which was rehearsed during the workshop and later shared with everybody over dinner. We learned and shared multilingual greetings and gestures over and over. This became an important part of our final performance, in which our ‘starting scene’ always went back to the act of greeting: Merhaba, Guten Tag, Bonsoir, Salut, Buna Seara, Norrik … We walked around the room, shook hands, hugged, waved and smiled. This was definitely a greeting and meeting overload, but one that (theatrically) celebrated the act of welcoming and meeting; and one that evoked (in me at least) a real feeling of connection to all workshop participants. These non-verbal body sculptures were shown and then narrated by the sculptor in their chosen language. Our multiple languages became part of the performance event itself. The metaphoric gaps created through the dialogue between body sculptures and multilingual narration were part of the ‘aesthetic enjoyment’. I venture that the audience was able to make enough meaning to get a short glimpse into our lives and our shared creative process, without needing to fully understand what was linguistically going on. At the same time this linguistic disorientation might have also protected us performers from any hasty conclusion by the audience about who we were and what we were trying to say ‘exactly’ about ourselves. Our final performance was framed by singing. An enthusiastic delivery of ‘Bruder Jakob’ in German opened our short piece and was closed by an equally wholehearted chanting of ‘À la pêche aux moules’ in French. This act of shared singing was not an expression of gained linguistic ‘competence’. At times I wasn’t even quite sure what I was singing exactly. I just knew that it was extremely enlivening belting out a French song with six other people who were possibly equally linguistically disoriented. Maybe we just bonded over our linguistic limitations and general foolishness of agreeing to sing in a foreign language in front of an audience. I certainly enjoyed this act of shared, musical, ‘multilingual bluffing’ and getting to know people in the process. Jane: I appreciated the chance to get to know the other workshop participants in a creative context and, most importantly, learn everyone’s names and interests. With each of the activities, there was plenty of rehearsal time and modelling so that we could learn from each other and also enjoy being together. I enjoyed finding out about how to say everyone’s name and what everyone was interested in. By singing, moving, listening and speaking in our different languages we were encouraged by Katja to share our work with everyone else at the arts workshop and it made a great way to end our drama workshop experience. This entry was posted in Case Study 3, CATC, Events, RMTC and tagged Bucharest, Case study 3, CATC, Jane Andrews, Katja Frimberger, RMTC, Romania, Symposium, Theatre, translating cultures, workshop. Bookmark the permalink.